Jamies Italian is a modern chain of restaurants offering affordable Italian cuisine within a relaxed and friendly atmosphere. My fiancé took me here last night and the atmosphere was good. The waiter was friendly. Our starters were ok - crispy squid and bruschetta. It took the staff ages to clear our table when we finished our starters. Our mains were not great. My burger was so dry and the chicken was far too minty. Not at any single point in the evening did anyone ask us if our food was ok. Our plates were also in front of us for ages and eventually we had to ask someone to take them away. I would never return to this place for food. Overpriced and rubbish. All about money and not about the food. While other celebrity chefs go for fancy – and expensive – restaurants in London, Jamie Oliver keeps to his roots with a more mainstream offering. 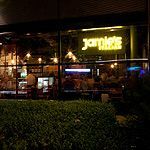 This particular Jamie's is a huge and gorgeously put together restaurant - if you’re fed up with neutrally decorated chain restaurants then this will put a big smile on your face. The large glass frontage floods the space in light during the day, highlighting the funky setting of black floors and sofa-style seating, industrial red chairs, marble topped tables and high-gloss exposed brickwork. Even the lighting on the industrial ceiling is cool. It looks like it's just upped sticks and left Shoreditch. Jamies Italian has been an instant hit with the locals, even if it's much more Clerkenwell than it is Islington - one senses a bit of propaganda with the address there, Jamie. It certainly gets busy though, and that’s lucky, because it’s such a large venue that if the crowds didn’t head here it could end up feeling sparse. As it is, trendy young locals book this place up in advance and there’s a really upbeat, laid back feel to the place. 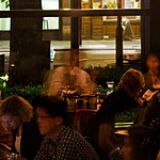 Even the staff are friendly and chilled out, though you may sometimes have to wait a little longer than you'd ideally like when the restaurant is full. It’s all in the name – Italian grub, Jamie Oliver style. The prices are hardly cheap but they are in keeping with competitors like Pizza Express, and they do offer good value for money when you factor in portion size and quality. You can opt for Italian nibbles and antipasti to start with, priced anywhere from £3.50 to £7. However, as long as you’re not starving hungry then a big bowl of pasta should be enough to keep you full, and works out as a borderline-cheap meal. The scallop and squid ink spaghetti (£13.90) comes highly recommended – a big pile of perfectly cooked, al dente spaghetti in a shimmering black colour (courtesy of the squid ink) with a deep, rich flavour that simple spaghetti doesn’t usually offer. It comes with big, meaty Brixham scallops that are perfectly cooked and generously doled out, so you won’t be hunting for them amongst all the pasta. Seasoned with hot chilli that's tempered by crisp parsley, anchovies, wine and capers, it's incredibly flavoursome, and more than enough to fill up a hungry belly. Alternatively, the prawn linguine (£12.50) is also good, if a little let down by Mr Oliver teaching you how to make an equally good one at home for a fraction of the price. Still, the well cooked prawns are delicious, with a pleasant garlic coating that lifts their natural sweetness. The tomatoes are well balanced by chilli, rocket and fennel. Again, this is a dish that’s big on flavour – something Jamie seems to pride himself on and is nice to see represented in his restaurants. The wine list at Jamies Italian is particularly good, with some nice little touches thrown in too, such as bottles sourced from wineries owned by friends of Jamie. It tells a story - something that's often missing from traditional wine lists. The choice is entirely Italian and they’ve even substituted champagne with prosecco, which is good to see as people often overlook the Italian sparkling bottles and really miss out on what the country can produce as a result. He also throws in a few organic choices too. And the prices? Very good, actually. Starting at just over £15, the most expensive bottles are £25.65, which is still incredibly reasonable. Jamie’s reputation is still intact with the new Jamie's Italian offering. Grazie mille Mr Oliver.